Luc Ferrari - L'Escalier Des Aveugles. Vinyl LP. Bleep. 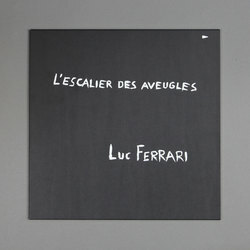 L’Escalier Des Aveugles — “The Blind Stairway” in English — was originally recorded in 1991, when renowned avant-garde composer Luc Ferrari was long established as one of Europe’s greatest. As such, the work (originally conceived for radio) is expectedly confident and inquisitive, a weaving of fact and fiction by a visionary weaver in full control of his craft. Featuring field recordings, readings and flourishes of supra- or pre-musical sounds recorded in Madrid, L’Escalier Des Aveugles is a poetic look at the surreality of reality.